Love this pile! It's full of all the new scrapbooking goodies on the market. CHA is great for getting to see the products up close then gathering catalogs to drool...I mean order from later. 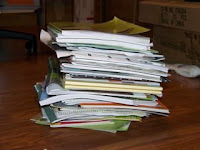 This is only a small portion of the stack of catalogs we collected today and this only the first day!! 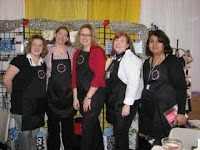 I'm so excited for Ali and Christy, owners of Midnight Oil Scrapbook Designs or MOSD. While not new to the industry, MOSD creates some crazy fun products, they are vending at CHA for the first time.I tell you it takes a lot of drive, passion and plain old guts to vend at a show of this magnitude. I'm so proud and excited for them!! MOSD ROCKS!!! All I can say is this little creature caused three grown ladies laugh till they had tears in their eyes, their sides hurt and I believe there were even some snorts!! Thanks for a great trip Wendy and Melissa! Had a blast! I flew in Tuesday night in the middle of an ice storm. Not a fun landing, I'm not fond of sliding on the runway. I decided to stay over at the airport hotel rather than try to drive home on ice at 11:00pm! I didn't have any problems driving home until I get to Shelli's to pick up Emma. I get stuck in her driveway and had to call Greg for help! I am so thankful that I got that close to home before trouble struck. Schools Closed AGAIN! They haven't gone all week due to ice and probably won't until Monday! Love them, love them going to school!!! They fight, they thumb wrestle, they argue, they are home, they are mine! I hate paperwork! I hate taxes! I will get taxes done!! I will not let them beat me! I will get taxes done!! Poor Emma! The only way she can get her dad to go to the movies with her is to have three teeth pulled out! Greg does not like going to the movies. I don't think he's been to a movie in the 6 years we've had Emma so for him to promise her that we would go if she was brave at the dentist was huge! We had a great time but he has no plans to go again soon!